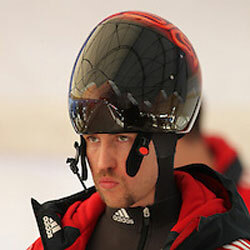 Favourite Sports Memory: Forerunning the skeleton race for the Vancouver Olympics. It was so amazing to have thousands of people cheering even though we weren’t even in the race! How you got involved in your sport: I was a track and field athlete before skeleton. 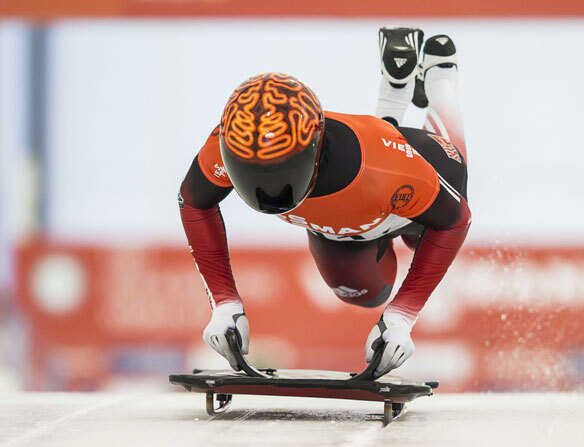 I participated in some skeleton recruitment camps in 2006, and was selected to race for Canada on the America’s Cup Circuit that winter while being coached by the newly crowned Olympic champion Duff Gibson. The moment you knew you wanted to represent Canada: Watching Donovan Bailey win the 100m in the 1996 Atlanta Olympics. CAN Fund Testimonial: CAN Fund will allow me the means to bring my personal starts and strength coach to the Sochi 2014 Olympics. I have been working with this coach for 15 years, and having her at the Olympics will be a huge asset for me to ensure that I perform my best on the world’s biggest stage. Share one valuable tool that you use on a daily basis that helps you to be the best athlete you can be: My Travel Roller and thera-bands, to keep my body healthy and injury free. Who is one person in your life that has impacted your career and what was it that they taught you: Kim Cousins has been my strength coach for 15 years. We started working together with our track and field club when I was in high school, and have continued throughout my career in skeleton. She has turned me into the athlete I am today, and I would not be where I am today without her.